Similar to the Alexander Construction family, Jack and Bernie Meiselman built affordable mid-twentieth-century modern post and beam homes in Palm Springs California during the years of 1959-1960. In fact, these homes are so similar to the popular Alexander houses that Meiselman midcentury modern homes in Palm Springs that they are often compared to and sometimes mistaken for Alexander homes. Meiselman and Alexander mid-century modern homes share many similar architectural attributes. Characterized by crisp clean lines, butterfly roofs, and soaring clerestory windows - the Meiselmans used post and beam construction, with tongue and groove ceilings, and architecturally sculpted concrete block as shade blocks and as a design element. 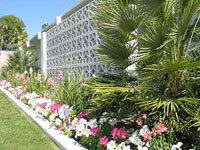 Decorative concrete blocks provide both form and function, design and sun shade, for Palm Springs Alexanders and Meiselman homes. The Meiselman homes and the Alexander homes helped define the carefree and sunny indoor / outdoor modern living lifestyle that Palm Springs is world famous for. Meiselman houses feature large walls of glass that overlook the pool and the beautiful mountain backdrops in Palm Springs. Most Meiselman homes also included central heating and air conditioning, a new concept at the time they were built in 1959, which allowed residents year round enjoyment of their Palm Springs vacation homes. Meiselman homes have a small galley-style kitchen adjacent to the living room, while Alexander homes have a kitchen that opens onto to the great room living area room and dining room space. Meiselman homes generally have a master suite that is separate from the other guest room, while the Alexander house layout features each of the three bedrooms lined up in a row (separated by closets) on the same side of the house. Windows are different in Meiselman houses. Clerestory windows near the top of the roofline are smaller and shorter than those of Alexander homes. Unlike Alexander homes where the roofline varies from house to house borrowing from A-frame pitched style, flat, and butterfly, the Meiselman homes are more sharply angular and primarily make use of Butterfly rooflines. The site, location, and placement of the Meiselman properties is also unique from Alexanders. 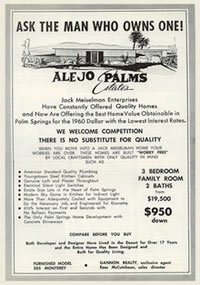 While the Alexander family of builders bought large plots of land to develop and built dozens (even hundreds) of similar homes in specific neighborhood tracts, Meiselman midcentury modern homes were built on scattered sites, one or two at a time, diffused throughout different neighborhoods of central and north Palm Springs, Ca. In the 1950's and 1960's, about 2,500 homes were built by the Alexander Construction Company. Meiselman built fewer than 200 houses, making Meiselman midcentury modern homes much more rare than Alexanders.